The effectiveness of activated carbon developed from African Locust Bean (Parkia biglobosa) leaves in adsorptive bleaching of natural pigment (anthocyanin) was studied using batch adsorption method. The anthocyanin was extracted from Roselle Calyces (Hibiscus sabdariffa) using ethanol acidified with Acetic acid (83:17, v/v). The adsorptive bleaching was done at different settings of variables i.e. temperature, time, concentration, pH and adsorbent dosage. The anthocyanin solution was characterized before and after bleaching and the results obtained in which the performance of the adsorbents was expressed in terms of percentage colour reduction (efficiency) shows that the optimum adsorption was at 50mins with 91.47% adsorption efficiency, 4g adsorbent dosage with 90.47% efficiency, temperature of 60⁰C with 94.97% efficiency, 30%concentration with 88.31% efficiency and pH of 6 with 80.11% adsorption efficiency; while the kinetic study give 88% colour reduction. The adsorption also follow Pseudo second order kinetics. Adsorption is a process in which a substance (adsorbate), in gas or liquid phase, accumulates on a solid surface. It is a simple and low cost system for the extraction of heavy metals and other charged particles from solution (Eba et al., 2010). In a more chemical language, it is the extraction of matter from one phase and concentrating/accumulating it on the surface of a second phase. It is also referred to as interface accumulation (Ntemi, 2013). The study of adsorption of various substances has been explored by many researchers, this ranges from the adsorption of heavy metals, dyes and colourants to other chemicals that are involved in various processes (Tawiah et al. 2016). Adsorption of dyes/colourants is a classic field of interest to chemists, this arises due to two main reasons. The first is the environmental impact of some of the dyes –as such they need to be removed from the environment (effluents) to avoid contamination and intoxication. The second is the isolation of the colourants from a substance due to its usefulness in dyeing or just to remove the colour from the substance (Yao et al., 2015). The extraction of anthocyanin from various fruits has been explored by many researchers due the fact that it is being used as a colourant in food industries and it has great potential in textile industries (Tawiah et al. 2016). The major methods of extraction of anthocyanin are the aqueous extraction and alcohols extraction (Tsai et al., 2002; Wong et al., 2003, Cissé et al., 2011). It was also proved that acidification of the solvent aids the extraction process (Mantell et al., 2002, 2004; Pinelo et al., 2005). The adsorption of anthocyanin from Roselle calyces is not well explored in Nigeria. As such this research is toggled to study the performance of African Locust Bean leaves, in the adsorption of the colour pigment of Roselle calyces (anthocyanin) using acidified ethanol as a solvent. There are two types of adsorption; physiosorption and chemisorptions (Mohamed, 2011). Physiosorption: also called Physical adsorption is governed by simple inter molecular Van der Waals forces. Physiosorption is non–specific and a reversible process. There is no electron exchange between adsorbent and adsorbate. Chemisorption: also called chemical adsorption results from the chemical bonding between adsorbent and adsorbate molecule, therefore it is specific as well as irreversible and chemical as well as electronic properties of adsorbent are changed. The adsorption process of the adsorbate molecules from the bulk liquid phase onto the adsorbent surface involve some stages (Tchobanoglous et al., 2003). In the first step, the adsorbate diffuses from the bulk to the external surface of the adsorbent m. As a consequence of this mass transfer, the adsorbent acquires superficial hydrophobic or hydrophilic properties, which modify the state of equilibrium in the medium (Ghinwa and Bohumil, 2009). In the second step, the adsorbate molecule migrates from the relatively small area of the external surface to the macropores, transitional pores, and micropores within the adsorbent. Most adsorption occurs in the micropores because the majority of available surface area is there. In the third step, the adsorbate molecule adheres to the surface of the pore. We can make an assertion that, steps 1 and 2 are diffusional processes that occur because of the concentration difference between the bulk adsorbate and the layers of the adsorbent. Step 3 is the actual physical or chemical bonding between the molecule and the adsorbent surface and occurs more rapidly than steps 1 and 2. According to Younus (2014), adsorption isotherms are graphical representation of the adsorption process that occurs at surfaces at constant temperature. The definition of a graphical isotherm applied for the analysis of a liquid/solid system is “a curve describing the phenomenon governing the retention or mobility of a substance from aqueous media to a solid phase at constant temperature”. Isotherms provide information about the adsorption equilibria and predict the level of adsorbate uptake by the adsorbent. Alejandro (2015) also stated that adsorption isotherms are required to obtain thermodynamic parameters needed for the quantitative analysis of the fluid-solid systems. These parameters offer information related to adsorption capacity, possible adsorption mechanism and describe the surface features such as the attraction to the adsorbate (Kumar and Sivanesa, 2007). The equilibrium state is achieved when adsorption and desorption rates are equal and sorbent concentration remains constant. The most frequently used models in the analysis of aqueous systems are based on the isotherms proposed by Langmuir, Freundlich and BET. The Langmuir adsorption model developed by Irving Langmuir provides a simple equilibrium expression for the adsorption of a monolayer process. It was developed to describe gas-solid-phase adsorption onto activated carbon. Subsequent development provided a description of adsorption behavior of solutes in a solid-solution. The Langmuir model describes the monolayer adsorption of an infinite number of localized identical and equivalent sites. A graphical representation of the Langmuir isotherm is a hyperbolic function which has a characteristics plateau indicating the equilibrium saturation point, characteristics of adsorption of gas on homogeneous surface system (Ruthven, 1984 and Langmuir, 1916). Ce is the equilibrium concentration of adsorbate. The Freundlich model explains the exponential relationship between the adsorbent and adsorbate in the low to intermediate concentration range while Langmuir isotherms show better fitting of data at higher concentration. This model also assumes monolayer coverage of adsorbate on adsorbent surface. The Freundlich model represents adsorption of adsorbate per unit mass of adsorbent under pressure. Where; Kf and n are Freundlich constants, “n” is an integer that represents surface heterogeneity and is dimensionless (Gregg and Sing, 1982). The Brunauer-Emmett-Teller (BET) model represents an extended form of the Langmuir equation by accounting for multilayer surface coverage where, the van der Waals interaction on the surface of the adsorbent is more favorable system (Ruthven, 1984). Alejandro (2015) argued that the non-linear regression methods generally involve the use of error functions in order to “minimise the error between the experimental and predicted data” (Kumar et al., 2004), one of the most used functions is the correlation coefficient R2. 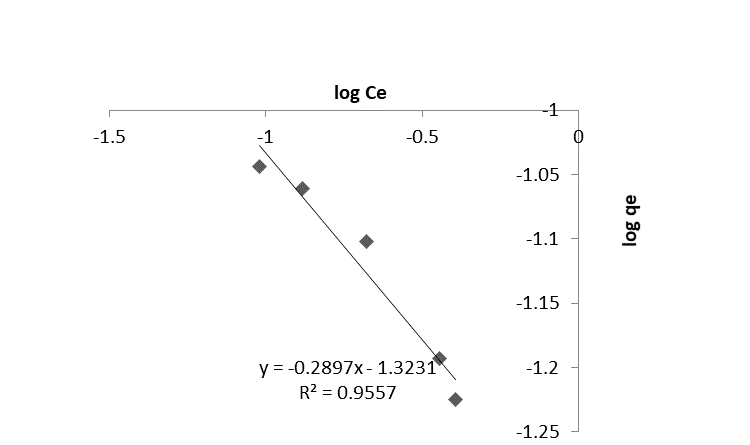 This correlation coefficient determines the isotherm to which the adsorption process fit best (higher value of R2). Kinetic models are important components in the adsorption/desorption phenomena characterisation. Since adsorption is a time-based process, the rate of change gives important information about how chemical properties are changing with time (Alejandro, 2015). For example, the minimal residence time to achieve an equilibrium state. In contrast to the thermodynamic models, when only final states are described, kinetic information such as rates of changes and the possible mechanism are crucial parameters in the design, regeneration and scale-up of adsorptive processes and materials (Azizian, 2004). First and second order models are discussed below. The rate constant for this equation could be physically interpreted as “the proportionality between adsorption rate and the distance of the system from the equilibrium” (Miyake et al., 2013). In 1984 Blanchard presented an new equation based on the assumption that concentration does not change significantly during the first stage of the adsorptive process and the influence of more than one type of adsorptive sites was noticed then - the kinetic order is two with respect to the number of available sites for the exchange. The original work reported the removal of ammonium and metallic ions from drinking water using natural zeolites. In 1998 Ho and McKay reviewed the Pseudo Second Order equation, analysing kinetic data of previously published works that had been reported as first order systems. Their findings revealed that Pseudo Second order model described more accurately their results than the Pseudo First order equation, they also stated that Pseudo First order is a restricted model for just a segment of the reaction range. qe and k2 are obtained from the slope and interception of the plot t/q against t.
The main assumptions of Pseudo Second Order equation are that adsorption is dependent on the adsorptive solid capacity in the form of available fraction of active sites and can involve chemisorption, contrasting with first order model where the reaction kinetics is dependent only on the solution’s concentration (Ho, 2006). Recent theoretical studies have suggested that Pseudo Second order is more accurate when the adsorptive initial concentration is low, but when concentration is higher data better fits Pseudo First Order equation (Azizian, 2004). In the work of Tawiah et al. (2016), anthocyanin was extracted from Hibiscus sabdariffa (dried calyces), adsorped using aqueous macroporous resin adsorption method, and characterized for dyeing wool fabrics. The anthocyanin extract contained compounds namely 2-delphinidin-3-sambubioside and cyaniding-3-sambubioside at the molecular weights 595.0 and 499.0 respectively and were used to dye wool fabrics. 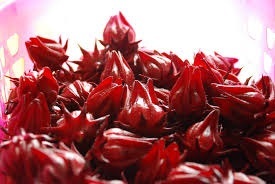 The optimal extraction conditions for Hibiscus sabdariffa (dried calyces) was 1:15 by weight of dried calyces and HCl acidified ethanol solution with 5% concentration Tween-80 at pH 5 with extraction temperature 55oC for 2hours. In the work of Yao et al. (2015), powdered bilberry extract prepared from ripe bilberry fruits (Vaccinium myrtillus L.) was found to be rich of anthocyanins (purity of 36%). Macroporous polymeric adsorbtion method was established to obtain anthocyanin compounds from bilberry, in which the purity of the anthocyanins was improved to 96%. A series of macroporous polymeric adsorbents based on the copolymerization of divinylbenzene and ethylene glycol dimethyl acrylate was designed. In this situation, ethylene glycol dimethyl acrylate regulated the polarity of the adsorbent and also acted as the cross-linking agent to ensure the matrix structure of the adsorbent, which had a high specific surface area and provided more interaction sites during adsorption with anthocyanins. Among the synthesized polymeric adsorbents with different contents of ethylene glycol dimethyl acrylate, the one with 20% ethylene glycol dimethyl acrylate content was demonstrated to exhibit optimal adsorption capacity and selectivity to anthocyanins compared to various commercial adsorbents through static adsorption and desorption experiments. In addition, the optimum condition of the dynamic adsorption–desorption experiment was further explored. Their results indicated that the purity of anthocyanins after rinsing with 20% ethanol was determined to be approximately 96% at a desorption ratio of 83%, which was clearly higher than that in powdered bilberry extract. As reported by Kang et al. (2014), black rice was used to produce anthocyanins. Integrated methods for extraction and purification of anthocyanins were investigated. Four solvents and 6 adsorbents were used for extraction and purification, respectively. Acidified 70%(v/v) ethanol resulted in the highest anthocyanin extract concentration of 461.72 mg/L. Amberlite had the highest adsorption capacity of 0.406±0.010 mg/g of adsorbent and desorption capacity of 0.252±0.016 mg/g of adsorbent. Acidified ethanol effectively eluted anthocyanin pigments from Amberlite at a concentration of 60%(v/v). Experimental adsorption data best fit to pseudosecond-order kinetic and Langmuir isotherm models. Purification parameters were optimized through dynamic adsorption/desorption experiments with Amberlite. The concentration of sugars (impurities) decreased from an initial 452.78 μg/mL to 169.75 μg/mL after purification. Also, in the work of Hua et al. (2013), the effect of an aqueous two-phase system composed of hydrophilic solvent and an inorganic salt, ethanol and ammonium sulfate on the partition of anthocyanins was investigated to obtain the optimum condition for the extraction. The aqueous two-phase system composed of 30% (w/w) ethanol/19% (w/w) ammonium sulfate was found to yield the best result. Meanwhile, the AB-8 resin fit for the purification of anthocyanins. Compared with conventional extraction based on acidified ethanol, an integrated process of aqueous two-phase system combined with column chromatography has shown some added advantages, such as short treatment time, lower ethanol consumption and no heating requirement to yield anthocyanins from the fruit residue of V. uliginosum. In another work, adsorption of roselle anthocynins onto various macroporous resins was optimized to develop a simple and efficient process for industrial separation and purification of roselle anthocyanins. Nine different macroporous resins were evaluated for the adsorption properties of the anthocyanins extracted from the calyx extract of Hibiscus sabdariffa L. The influences of phase contact time, solution pH, initial anthocyanin concentration, and ethanol concentration with different citric acid amounts were studied by the static adsorption/desorption method. The adsorption isotherm data were fitted well to the Langmuir isotherm, and according to this model, LS-610B and LS-305 exhibited the highest monolayer sorption capacities of 31.95 and 38.16 mg/g, respectively. The kinetic data were modeled using pseudo-first-order, pseudo-second-order, and intraparticle diffusion equations. The experimental data were well described by the pseudo-second-order kinetic model. Continuous column adsorption–regeneration cycles indicated negligible capacity loss of LS-305 during operation. The overall yield of pigment product was 49.6 mg/g dried calyces. The content of roselle anthocyanins in the pigment product was 4.85% (Chang et al. (2012). Moreover, it has been found that the solid-to-solvent ratio and the particle size had a strong effect on both extraction velocity and anthocyanin extraction yield. The main effect of the solid-to-solvent ratio was to increase the anthocyanin yield and decrease the anthocyanin content. Higher temperature favored extraction by increasing diffusion coefficient on anthocyanins. This enhancement of the mass transfer process resulted in lower extraction time and had no positive influence on the anthocyanin extraction yield and anthocyanin content for a given solid-to-solvent ratio. The experimental data for extraction yield and concentration content were very close to those determined from the model that coupling the solid–liquid extraction and the thermal degradation of anthocyanins. Depending on the purpose of production, products to manufacture and subsequent operations, a compromise must be found between the anthocyanin extraction yield and the anthocyanin content (Cissé et al., 2011). Tawiah et al. (2016), described Hibiscus sabdariffa as a perennial plant belonging to Malvaceae family. It has red stems, serrate leaves and red calyces. The calyces contain flavonoids, gossypetine, hibiscetine and sabdaretine. Hibiscus sabdariffa contain different anthocyanins such as cyanidin 3-rutinoside, del- phinidin 3-sambubioside, cyanidin 3-sambubioside, cyanidin 3-glucoside and delphinidin 3-glucoside. The anthocyanins are responsible for the red color, while the sour taste is due to the presence of some organic acids (Abou-Arab et al., 2011). The leaves and the white calyces are eaten as vegetable, the flowers and fruits are used to produce drugs for cough and bronchitis (Ijeomah et al., 2012) while the calyces is used to prepare beverages and is a source of natural food coloring agents. In Hausa land, “soborodo” is prepared from the water extract of the dried calyces. Hibiscus sabdariffia is a plant of considerable economic potential. Its calyces have been suggested as emulsifier for carbonated drinks, jam manufacture and juices (Duangmal et al., 2004). The calyces are rich in anthocyanin, ascorbic acid and hibiscus acid (Asolkar et al., 1992). Roselle calyx is a rich source of dietary fiber, vitamins, minerals and bioactive compounds such as organic acids, phytosterols, and polyphenols, some of them with antioxidant properties (Abou-Arab et al, 2011). Ijeomah et al. (2012), reported that Hibiscus sabdariffa is very important for the use of its phytochemicals in the preparation of food supplements or nutraceuticals, functional food ingredients and in food additives, and pharmaceutical and cosmetic products. Rosselle is reported to be diuretic, digestive, antiseptic, sedative, purgative, emollient, demulcent and astringent. It is considered as a medicinal plant and is used for the treatment of cough and for wound dressing (Watt and Breyer-Brand, 1962). The calyces have many medicinal applications to cure kidney stone, pyrexia, liver damage, hypertension and leukemia (Abu-Tarboush et al., 1997). The extract is believed to possess bioactive, antiprotozoal, immunomodulatory, hepatoprotective, antidiabetic, hypotensive etc properties. So, aqueous extracts from calyces of H. sabdariffa present several interests (Cissé et al., 2011; Elhassan et al., 2014 and Diessana et al., 2015). The claimed medicinal benefits of H. sabdariffa can be attributed to the presence of anthocyaninins, which are the colored product of the flavonoid pathway. It has been shown that the yields of anthocyanins, by extraction with solvents, increases as the particle size of Roselle calyces decreases (Cissé et al., 2012). Also, the increase of the solid-solvent ratio improves the yields of phenolic compounds in the extract (Dai and Mumper, 2010). However, the use of temperatures higher than 70 °C for prolonged periods may cause significant degradation of anthocyanins (Cissé et al., 2009c; Gartaula and Karki, 2010, in Cid-Ortega and Guerrero-Beltrán, 2014). Anthocyanins are polyphenolic compounds responsible for cyanic colour (e.g. Pink, red, violet, dark blue) of most flowers, fruits, leaves and stems. They comprise the largest group of water soluble pigments in the plant kingdom ( Effiong, 2011; Cissé et al., 2011). Hua et al., (2013) reported that the recovery of natural pigments from plant materials is usually achieved by the method of solvent extraction. Solid–liquid extraction of anthocyanins is commonly carried out considering several parameters such as temperature, pH, solvent, etc. Methanol and ethanol containing a small amount of acid are the most commonly used solvents (Mantell et al., 2002, 2004; Pinelo et al., 2005). Hot water is also used (Tsai et al., 2002; Wong et al., 2003). Effects of pH of extraction medium on effective diffusion coefficient of anthocyanin pigments have also been studied. Effects of temperature on the anthocyanins degradation and stability have also been carried out (Cissé et al., 2009c). These studies showed that acid may cause partial hydrolysis of the acyl moieties in acylated anthocyanins, especially in anthocyanins acylated with dicarboxylic acids (Wong et al., 2003; Chalermchat et al., 2004 an Fincan et al., 2004). The rate of mass transfer during solid–liquid extraction might be increased by reducing the particle size, increasing the effective diffusion coefficient due to the increase in extraction medium temperature, or change in the pH medium, in the structure of material (Cissé et al., 2011). Abou-Arab et al. (2011 reported that colour stability of anthocyanins depends on a combination of various factors including: structure of anthocyanins, pH, temperature, oxygen, light and water activity. Enzymatic degradation and interactions with food components such as ascorbic acid, sugars, metal ions, sulfur dioxide and copigments are no less important (Jackman and Simith, 1996). Luvonga (2012), reported that the rate of anthocyanin destruction depends on many factors such as pH, temperature, intermolecular copigmentation, ascorbic acid, and oxygen concentration. The reactions are usually undesirable in juice processing and long-term product storage (Mazza and Miniati, 1993). It appears that the stability of the anthocyanin 3 – 5 diglucosides of grapes increases with an increasing degree of grapes of methoxylation but decreases with an increasing hydroxylation of aglycone. Some Functions of Anthocyanins include: Pigmentation, Anthocyanins act as a UV-protection for plants, Treatment of Vision Disorder, Neuroprotection, Inhibition of Cardiovascular Diseases, Cancer prevention (Effiong, 2011). Parkia biglobosa, is a perennial tree of legume, belonging to the family of fabacae as identified at the Department of Plant Biology, Bayero University, Kano. The seeds of the plant are enclosed in a yellowish, mealy, sweet tasting edible pulp. The leaf extract contains cardiac, saponin glycosides and phenolic content. The fruit pulp and seeds are rich in protein and lactose constituting vital form of energy. The roots, barks, leaves, stem, flowers, fruits and seed of a parkia biglobosa are all medicinal. Also, the plant has the capacity to resist drought situation due to its deep tap root system (Adamu and Ahmadu, 2015). Study submitted that leaves, fruits, nuts and oils obtained from Parkia biglobosa have provided food for humans, livestock and wildlife in many parts of the country. The roots, barks, leaves, stem, flowers, fruits and seed of Parkia biglobosa are all used medicinally to treat a range of aliments including diarrhea, ulcers, pneumonia, burns coughs and jaundice (Sacande and Clethro, 2007). El Mahmood et al. (2007) explained that, the mealy pulp from the fruits is eaten raw or is mixed with water to make a sweet and refreshing drink rich in carbohydrates. Boiled pods are used to dye pottery black; the ash is applied as a mordant. The bark is rich in tannins and may be used for tanning. The leaves are sometimes eaten as vegetable, usually after boiling and then mixed with other foods such as cereal flour. Young flower buds are added to mixed salads. The bark is most important for medicinal uses, followed by the leaves. Medicinal applications include the treatment of parasitic infections, circulatory system disorders, such as arterial hypertension, and disorders of the respiratory system, digestive system and skin. In veterinary medicine, a root decoction is used to treat coccidiosis in poultry. The wood is suitable for making kitchen implements, such as mortars, pestles and bowls, and handles of hoes and hacks. It is also used as firewood, and may be suitable for paper production. African locust bean has a reputation for soil improvement; its leaves are applied as green manure. It is also important in apiculture, being a good source of nectar and suitable for the placement of hives (Adie et al., 2014). Recently, the attention of researchers has been drawn to the great potentials in Parkia biglobosa as a source of an antibacterial agent. Ajaiyeoba (2002); Banwo et al, (2004); Millogo-Kone et al, (2006) reported the presence of plant secondary metabolites which are known to exhibit antibacterial activity against a wide range of organisms (Udobi and Onaolapo, 2012). The aim of this work is to study the kinetics and thermodynamics of adsorption anthocyanin pigment on to African Locust Bean Leaves. ii. 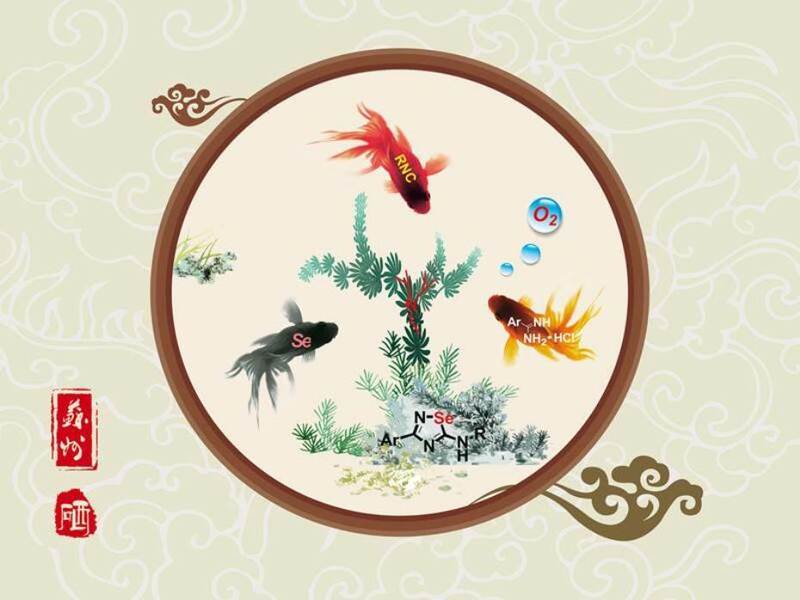 To adsorb the anthocyanin on to the developed carbon and study the effect of contact time, temperature, concentration, adsorbent dosage and pH on the adsorption process and its kinetics. This work is limited to the extraction of anthocyanin pigment from Roselle calyces and its adsorption on acid activated carbon developed from African Locust Bean Leaves and study the kinetics of the process. Dried Roselle calyces obtained from Rimi market of Kano city and the fresh ones were ground using a blender. The powder was sieved and the finest ones were kept in a polythene bag for extraction. Ethanol (96%) was obtained from the store of the Department of Pure and Industrial Chemistry, Bayero University, Kano. 72ml of the 96% ethanol was measured into a 250ml standard volumetric flask and was made to the mark with distilled water and the mixture was agitated. 38.6ml of acetic acid (17.5M, 99.5% and 1.05g/ml) was accurately measured into a 250ml volumetric flask and then made to the mark with distilled water and the mixture was agitated. 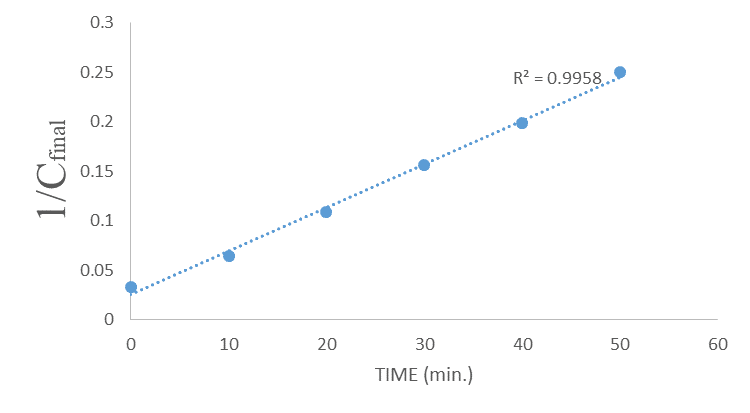 100ml of the 40% ethanol was measured into a 250ml volumetric flask, 20ml of the 2M acetic acid was then added to the flask making a ratio of 83:17 (v/v). The mixture was then agitated. 7.5g of the prepared dried Roselle calyces powder was weighted into a 250ml conical flask. 120ml of the acidified ethanol (measured to be 112.5g by weight) was added to the flask. The mixture was heated in a water bath at a constant temperature of 100oC while simultaneously agitating for 1hour. The mixture was allowed to settle for 24hours and then filtered using filter paper. The filtrate was then characterized using FT-IR and UV spectrophotometer. 75.2ml of the sulphuric acid (26.6M, 98.07%, and 2.66g/ml) was accurately measured and transferred 1000ml volumetric flask and made to the mark with distilled water and the mixture was agitated. African Locust Bean Leaves were obtained from the tree at the Level IV Laboratory Garden and then forwarded to the department of Botany, Bayero University, Kano for identification and certification. The leaves were then air-dried (under shade). The dried leaves were ground using a blender. The powder was sieved and the finest one was characterized using FT-IR spectrophotometer and kept in a polythene bag for further use. The dried African Locust Bean leaves powder was introduced into crucible and then carbonized in a muffle furnace at 300oC for 1hour. The carbonized powder was allowed to cool and further pulvarized. 15g of the carbonized power was placed in a 250ml beaker containing 150ml of the prepared 2M sulphuric acid. The content of the beaker was homogenized and allowed to stand for 24hours for impregnation. The mixture was then filtered using Whatmann No.1 filter paper using suction machine. The residue was continuously washed with distilled water using a Buchner funnel till the pH of the filtrate is neutral. The residue was then air dried and further crushed and sieved. The finest powder was analysed using FT-IR and kept for further use. Stock anthocyanin solution (1ml) was introduced into a 100ml standard volumetric flask and then made to the mark with acidified ethanol and then agitated (making 1% v/v anthocyanin solution). 1g of the activated African locust bean leaves carbons powder (the adsorbent) was introduced to a 250ml conical flask and 100ml anthocyanin solution was added to the flask. The mixture was agitated in an incubating shaker at a temperature of 30oC for 1hour. The mixture was then filtered using filter paper and the filtrate was analysed using UV spectrophotometer. The adsorbent (1g) was introduced into six conical flasks. 100ml of 1% anthocyanin solution was added to each flask. The six flasks were heated in an incubating shaker at a temperature of 30oC for different contact time (0, 20, 30, 40, 50 and 60 minutes). Varying concentrations of the anthocyanin solution (10, 20, 30, 40 and 50%) measured 100ml each were added to five conical flasks containg 1g of the adsorbent each. 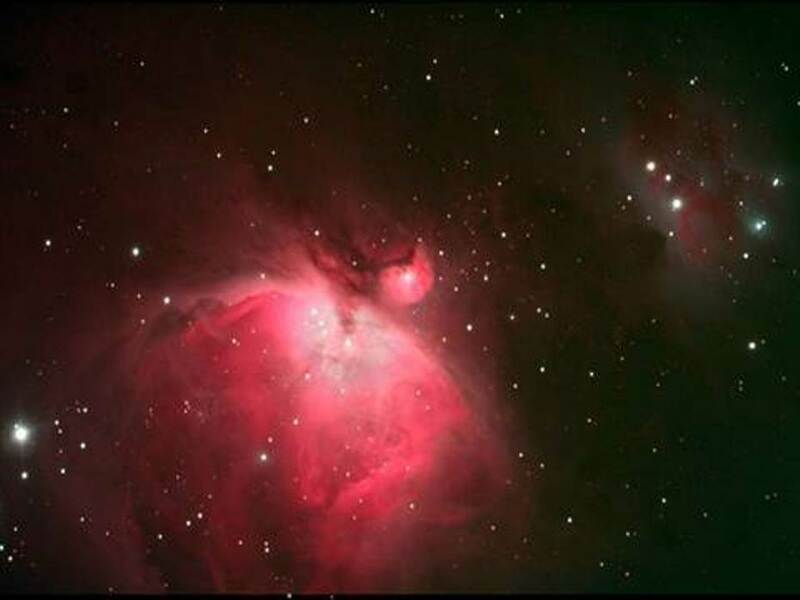 The flasks were heated at a constant temperature of 30oC in an incubating shaker for 1hour. The flasks were removed and filtered. The filtrates were analysed using UV-spectrophotometer. Adsorbent wheighed 1g was introduced into five conical flask each. 100ml of 1% anthocyanin solution was added to each flask. The flasks were heated in a water bath for vaying temperatures (30, 40, 50, 60 and 70 oC) for 1hour while simultaneously agitating. The flasks were removed and filtered. The filtrates were analysed using UV-spectrophotometer. Fixed amounts of the adsorbent (1, 2, 3, 4 and 5g) were added to five conical flasks containing 100ml of 1% anthocyanin solution each. The flasks were heated at a constant temperature of 30oC in an incubating shaker for 1hour. The flasks were removed and filtered. The filtrates were analysed using UV-spectrophotometer. The adsorbent weighed 1g was introduced into five conical flasks each. 100ml of 1% anthocyanin solution was added to each flask. The pH of the contents was varied between 5 and 7 by using 2M sulphuric acid. The flasks were heated at a constant temperature of 30oC in an incubating shaker for 1hour. The flasks were removed and filtered. The filtrates were analysed using UV-spectrophotometer. The optimum conditions for the effect of adsorbent dosage, temperature, pH and concentration experiments (4g, 60oC, pH of 6 and 100ml of 30% anthocyanin concentration) where used and the absorbance was determined for different time interval (10, 20, 30, 40 and 50min). The final concentrations were determined and then used for the kinetics modelling. The effect of contact time is represented by Figure 3.1, it can be observed from the graph that, the rate of the removal of anthocyanin increase with increase of contact time. This is expected because a large number of surface sites are available for adsorption at the initial stages. However, after 50 minutes, the adsorption remain constant because the remaining surface sites are difficult to occupy as the adsorbent is saturated. Fig. 3.1 plot of efficiency against time. Figure 3.2 shows the result of the adsorbent dosage, as we can see from the graph, increase in adsorbent dosage leads to increase in adsorption. The adsorption increased due to the increase in surface area and available adsorption sites with increase in adsorbent dose. The highest adsorption efficiency was observed at 4g which is 90.47%. The effect of temperature on the adsorption of anthocyanin solution is shown in Figure 3.3. It can be deduced from the graph that, the percentage removal and the amount of the adsorbed anthocyanin increase with increase in temperature which might be due to the rise in the kinetic energy and the diffusion of the anthocyanin solution molecules. The highest adsorption was observed at 60⁰C with 94.97% adsoption efficiency. 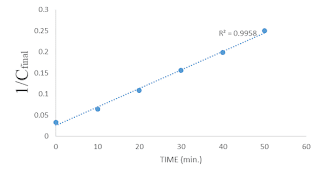 Figure 3.4 shows the effect of the initial concentration on the adsorption of anthocyanin solution. The adsorption increases with increase in the concentration of the adsorbate. The percentage removal increased because, at higher concentration, the available sites for adsorption on the adsorbent became limited due to the competition between the anthocyanin molecules. The effect of pH on the adsorption capacity of the activated carbon prepared from African Locust Bean (parkiabiglobosa) leaves was given in Figure 3.5. It can be observed that, the adsorption increased rapidly from 5 to 6 where it then decreased rapidly also. This trend may be explained on the basis of the fact that at pH below 6, the anthocyanin solution readily enter into the pore structure of the adsorbent surface. The adsoption isotherms were investigated using the Langmuir model by plotting the graph of Ce/qe against Ce and the Freundlich model by plotting the graph of Logqe against LogCe the results obtained as in Figure 3.6 and Figure 3.7 shows that the adsorption of anthocyanin on to the activated carbon fitted to both Langmuir model with (R2 =0.992) and the Freundlich model with (R2 = 0.955). Figure 3.8 shows that the kinetics modelling of the adsorption of anthocyanin onto the activated carbon developed from African Locust bean leaves follows Pseudo second order model with R2=0.9958. Fig. 3.8 plot of Kinetics Study (Pseudo second order Model). From the result of this experiment we can conclude that the optimum conditions for the adsorption of anthocyanin onto African Locust Bean Leaves. From the effect of time, the optimum adsorption was at 50mins with 91.47% adsorption efficiency and that 50mins agitation time was sufficient for the optimum removal of anthocyanin. Also, 4g adsorbent dosage with 90.47% efficiency , temperature of 60⁰C with 94.97% efficiency, 30%concentration with 88.31% efficiency and pH of 6 with 80.11% adsorption efficiency. Therefore, the activated carbon prepared from African Locust Bean (Parkia biglobosa) leaves was proved to be capable of removing anthocyanin with a high efficiency and the adsorption follows pseudo second order model. ubdariffa). Journal of American Science, 7(7). functional properties of karkade (Hibiscus sabdariffa) seed products” Cereal Chemistry 74:352–355. Parkia bicolor leaf extracts. African Journal of Biomedical Research; 5 (3): 125 – 129. Heavy Metals Adsorption. Unpublished PhD thesis, University of Manchester. Glossary of Indian Medicinal Plants with Active Principles Part 1 (A-K). Council of Scientific and Industrial Research, New Delhi, India, ISBN: 8172360487: 44.
of Parkia clappertoniana keay family Leguminosae against selected microorganisms. Nigerian Journal of Pharmaceutical Research 3(1): 16-22.
extraction of red beetroot pigment: mathematical modelling of mass transfer. Journal of Food Engineering 64 (2), 229–236. sabdariffa: Experimental kinetics and modeling. Journal of Food Engineering 109:16–21. du bissap (Hibiscus sabdariffa L.) au Sénégal. Fruits 64 (2), 111–124. sabdariffa L.): composition et principales utilisations. Fruits 64 (3) , 179–193. degradation kinetics of anthocyanins from blood orange, blackberry, and Roselle using the Arrhenius, eyring, and ball models. Journal of Agricultural and Food Chemistry 57 (14), 6285–6291. Diessana Arthur, Charles Parkouda, Mady Cissé, Bréhima Diawara and Mamoudou H. Dicko1 (2015). Optimization of Aqueous Extraction of Anthocyanins from Hibiscus sabdariffa L.
colorant and improvement of its color stability. Proceedings of the AIC Color and Paints, Interim Meeting of the International Color Association, 2004, IEEE Xplore: 155-158. (2010). Evaluation Of The Absorption Capacity Of The Natural Clay From Bikougou (Gabon) To Remove Mn (II) From Aqueous Solution. International Journal Of Engineering Science And Technology, 2(10):5001 – 5016. Zn, Cr And Cu Ions Using Cyanidin As Ligand. Unpublished MSc thesis, University of Nigeria, Nsukka. sabdariffa L.) Calyx cultivated in Sudan. Journal of Medicinal Plants Research. 8(4):217-222.
biglobosa(Jacq) root bark extract against some microorganisms associated with urinary tract infections. Afican Journal of Biotechology. 6 (11): 1272-1275.
extraction of red beetroot pigment. Journal of Food Engineering 64 (3): 381–388. (Hibiscus Sabdariffa var. sabdariffa) in aqueous medium. Journal of Food Science and Technology Nepal, 6:69-72. Industrial And Hazardous Wastes Treatment)- Chapter 9: Treat Of Metal Bearing Effluents, Removal And Recovery. (J. P.-T. Lawrence K Wang, Ed.) New York, London; Boca Roton. : CRC Press. pollutant removal on various sorbents,” Journal of Process Safety and Environmental Protection, 76(4):332 – 340. Hazardous Materials, 136(3): 681 – 689. Hua Zhang, Dong Yuesheng, Xu Ge, Li Menglu, Du Liya, An LiJia and Xiu Zhilong (2013). Jackman, R. L and Smith, J. L. (1996). Anthocyanins and betalains. In: Natural food colourants. G.A.F. Hendry and J.D. Houghton (Ed. ), 2nd ed., Blackie Academic and Professional, Great Britain. purification adsorbent to produce anthocyanins from black rice (Oryza sativa cv. Heugjinjubyeo). Journal of Food Science and Biotechnology. 23(1):97-106. Comparison of linear and non-linear methods,”Journal of Dyes and Pigments, 72(1):130 – 133. 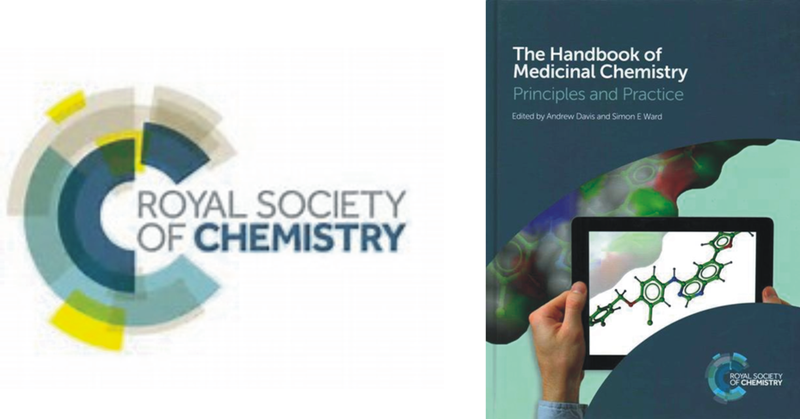 Chitosan Chemistry and Pharmaceutical Perspective. Chemical Review 104:6017-6084. Lagergren S., B. Svenska, and R. Swed(1898). Academic and Scientific Document Band 24:1-13,. Solids Journal of Americal Chemical Society:2221.
red grape pomace in packed beds: experimental results and process modelling. Journal of Chemical Engineering Science 57 (18), 3831–3838. model food dye (malvidin 3,5-diglucoside) in a high pressure CO2 plus methanol system. Journal of Supercritical Fluids 29 (1–2):165–173. activity of the stem bark and leaf extracts of Parkia biglobosa (Jacq) Benth on Staphylococcus aureus. African Journal of Traditional Compound and alternative medicines. 3(2): 74- 78.
second order kinetic model of adsorption. application to the adsorption of Ag(I) to mesoporous silica microspheres functionalized with thiol groups, Chemical Engineering Journal, 218:350 – 357.
photocatalytic oxidation. Unpublished PhD thesis, Institut National Polytechnique de Toulouse. Treatment Methods. Unpublished PhD thesis, Freie Universität Berlin. and solvent-to-solid ratio on the total phenolic content and antiradical activity of extracts from different components of grape pomace. Journal of Agricultural and Food Chemistry 53 (6): 2111–2117. anthocyanins extracted by aqueous macroporous resin adsorption method for dyeing of wool fabrics. International Journal of Science and Technology, 6(1). Tchobanoglous, G., Burton, F. L., Stenset, H. D. (2003). Wastewater Eng, Treatment and Reuse. 4th Edition ed. McGraw-Hill Edition, New York, USA. capacity in Roselle (Hibiscus sabdariffa L.) extract. Food Research International Journal 35 (4), 351–356. and Eastern Africa. E.S. Livingstone Edinburgh, 737-739.
extraction of Roselle juice using response surface methodology: a comparative study with other extraction methods. Journal of the Science of Food and Agriculture 83(12):1273–1278. Yuh-Shan H. (2004). “Citation review of lagergren kinetic rate equation on adsorption reactions,” Scientometrics, 59(1):171–177.